It is specifically designed to fit model equations to experimental data. Other programs focus on technical graphics, symbolic manipulation, matrix operations or worksheets for engineering calculations. Scientist incorporates all these elements, but its primary function is fitting equations to experimental data. Scientist can fit almost any mathematical model from the simplest linear functions to complex systems of differential equations, non-linear algebraic equations or models expressed as Laplace transforms. 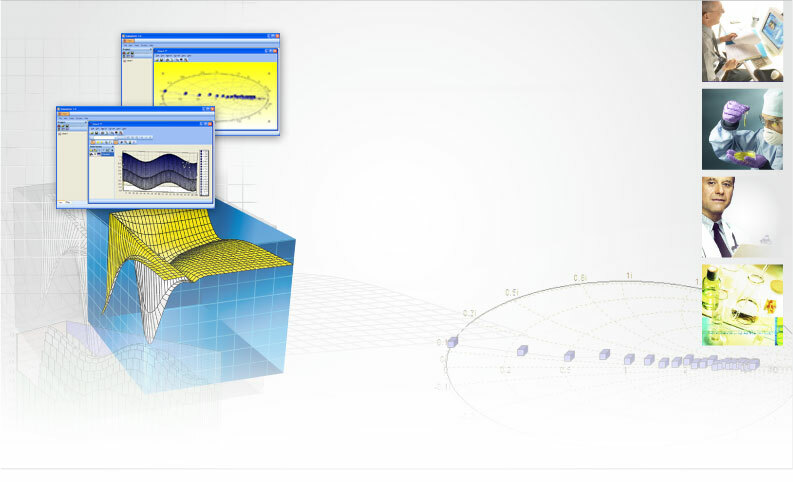 If you need to fit experimental data to mathematical models, you won’t find a better tool than Scientist for Windows! Libraries of mathematical models for Chemical Kinetics, Diffusion and Pharmacokinetics can be purchased separately. The Scientist Chemical Kinetic Library is a set of chemical kinetics models that can be used to simulate or analyze experimental data. The Chemical Kinetic Library includes models for zero, first and second order irreversible reactions, first order reversible reactions, and parallel first order irreversible reactions with up to three products. The Library also includes models that can be used to fit data to pH-rate profiles, Arrhenius equations, or Eyring equations. The Library comes with a complete manual that documents each model. Scientist is required to use the models in the Chemical Kinetics Library. The Scientist Diffusion Library is a collection of linear models, expressed as Laplace Transforms, for simulating and analyzing diffusion and heat conduction. The Library contains models in which the Laplace Transform is readily obtained, but its inverse is not. Scientist's ability to perform inverse Laplace transforms numerically provides an extremely powerful tool for developing and solving models of diffusion and/or kinetics. The technique is particularly useful in building models of complex physiological systems. The Library comes with a complete manual that includes example calculations and discussion of the physical significance of the model. Scientist is required to use the models in the Diffusion Library. The Scientist Pharmacokinetic Library is a set of pharmacokinetic models that can be used to simulate analyze pharmacokinetic data. The Pharmacokinetic Library includes one- and two-compartment models expressed as mono, bi-exponential and tri-exponential equations. The models include bolus input, constant rate IV input; first order or Michaelis-Menton output and both single and multiple dose models. Some models also include time lag before measurable blood levels occur. The library includes a complete manual that documents the models by solving example problems and each model includes a sample data set and parameter values. Scientist is required to use the models in the Pharmacokinetic Library. PKAnalyst® for Windows is designed to simulate and perform parameter estimation for pharmacokinetic models. With over two dozen built-in models, it can calculate micro rate constants for compartmental models, analyze saturable (Michaelis-Menton) kinetics, handle bolus and zero/first order input for finite and infinite time periods, and produce concentration/effect Sigmoid-Emax diagrams. Parameter estimation, statistical data analysis, and publication quality graphics can be obtained with just a few mouse clicks. PKAnalyst makes analysis of pharmacokinetic data easy! Chemist is a program for chemical equilibrium calculations. The program uses a simple Windows interface where you specify the compounds and their quantities that make up the solution of interest. These compounds are selected from a large database provided with the program and the quantities can be entered in many of units of either mass or concentration. Once the solution has been entered, you simply press a "solve" button and the program will perform the calculations and display the results in a spreadsheet. These results include molar concentrations and activity coefficients for all species in the solution, as well as pH, ionic strength, buffer capacity and estimated density.